It seems like it was just yesterday that I was watching my parents deal with the first pains of aging. Now, here I am, experiencing the same thing. As we get older, it seems that we wake up each day to find a new pain that we have to get used to. In fact, I noticed a new throbbing in my left shoulder when I got out of bed a few days ago. I figured the pain would subside after I got up and started moving around, but I was wrong. The annoying pain in my shoulder—the one that seemed to have come out of nowhere and only get worse—turned out to be a torn rotator cuff. These are usually diagnosed by a visit to your doctor, a few range-of-motion tests, and maybe an MRI, if deemed necessary. So that’s the first step I took. What is a torn rotator cuff? It happens when a tendon in your shoulder tears away from the bone it’s supposed to be attached to. It can either tear away partially, or the tendon can be completely severed from the bone. I’m lucky that my tear was only partial. Most often, these types of injuries are caused by repetitive stress, lack of blood supply, or bone spurs. People over 40, athletes, and those who participate in repetitive overhead activities are at an increased risk for rotator cuff tears. Tears can happen suddenly during a fall or strenuous activity, or they can happen gradually over an extended period. Either way, it can be a painful injury that gets increasingly worse when left untreated. I’m still not sure how my rotator cuff injury occurred, so it’s probably a matter of wear-and-tear, with me being an active guy in his 40s. When I saw my doctor, he advised me to take over-the-counter pain relievers to help with the shoulder pain. And, yes, painkillers can help alleviate your discomfort, but I know I want to avoid taking medication constantly. I certainly don’t want to become dependent on them. To me, the guy who’s always going on about alternative medicine, the better choice is to try some natural remedies to soothe my pain, to prevent myself from becoming reliant on commercial drugs. Like your doc should tell you, simply resting and icing your shoulder can help reduce inflammation. What he probably won’t tell you is that using an essential oil like peppermint can relax your muscles and give you some pain relief. Use a carrier oil like coconut or almond oil, add a few drops of peppermint, and gently apply to the affected area. 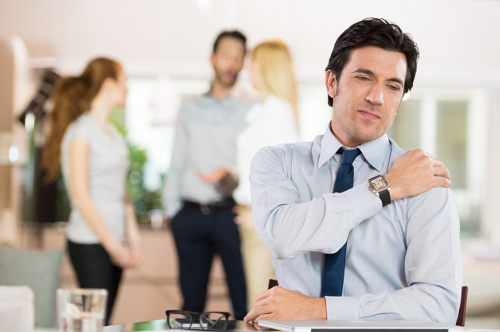 While a torn rotator cuff can be a painful injury, it actually isn’t just one of those aches and pains we have to deal with as we age. You can use natural remedies to help ease the pain and discomfort while your shoulder begins to heal. “Rotator Cuff Tears,” OrthoInfo; http://www.orthoinfo.org/topic.cfm?topic=A00064, last accessed June 7, 2017.